Please help our community — upload your photos of 15990293. This is a lamp, underhood (reel type) (mounted to fender), for Chevrolet Trucks, Cadillac Trucks, and GMC Trucks automobiles. It fits for 137 General Motors vehicles which were sold in the U.S. from 1988 to 1998. It's a genuine General Motors part with an OEM part number 15990293. Please keep in mind that this lamp is discontinued for the U.S. market since October 1, 2012, and is discontinued for Canada market since February 28, 2009. This lamp has dimensions 3.20 in × 7.70 in × 7.30 in, it has a weight of 12.00 ounces, usually, it comes in a set of 1 item in retail packaging. This genuine part is more expensive than some aftermarket parts, but buying this lamp will be a smart decision though, because you will be absolutely sure that it will serve you longer and will provide maximum safety and performance for your car. This part has passed not only all manufacturer's tests but also General Motors quality control and has to endure rough road conditions over a long time. This lamp 100% fits for General Motors cars. It's made of top quality materials, and might contain hazardous materials and that probably generate hazardous waste. Please check your local laws regarding hazardous waste disposal. This lamp comes in retail packaging with dimensions of 7.70 in × 7.30 in × 3.20 in and weight of 12.00 ounces. All the data on these charts reflect users search interest in GM 15990293 part based on search requests on oemcats.com website made between 2012 and 2018 years. Search interest in GM 15990293 part aggregated by months over time. 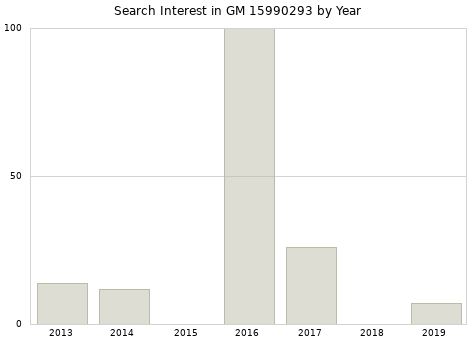 Monthly average search interest in GM 15990293 part over years from 2013 to 2018. 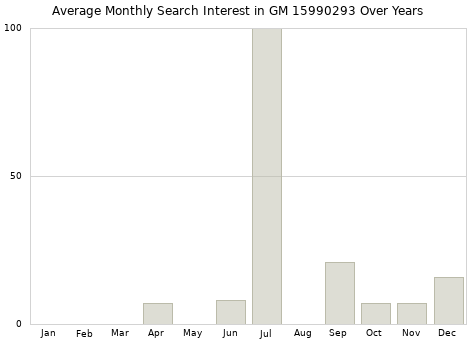 Annual search interest in GM 15990293 part. GM 15990293 monthly average sales over years from 2014 to 2018. GM 15990293 part annual sales from 2014 to 2018. 15990293 is discontinued since February 28, 2009 for Canada market.